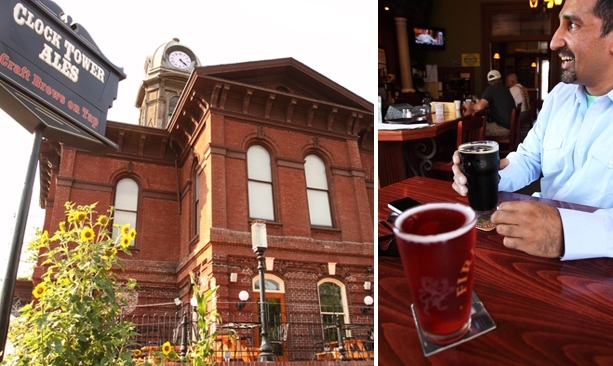 Housed in a former Wasco County Courthouse from the 1880s, Clock Tower Ales pours dozens of different beers. 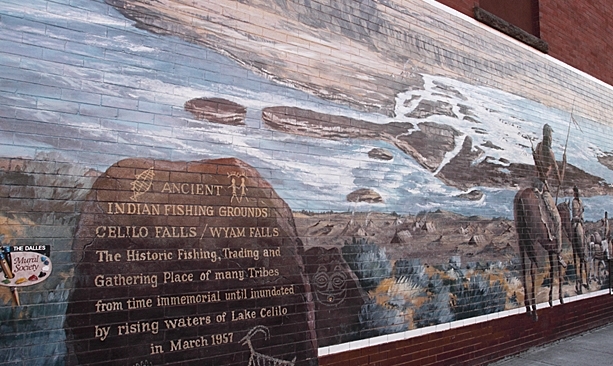 This mural depicts Celilo Falls, once located east of town and now covered by the backwaters of The Dalles Dam. 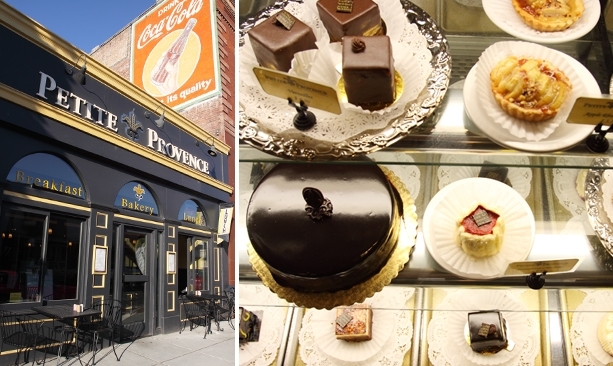 Petite Provence serves up sweet treats and savory breakfast and lunch. 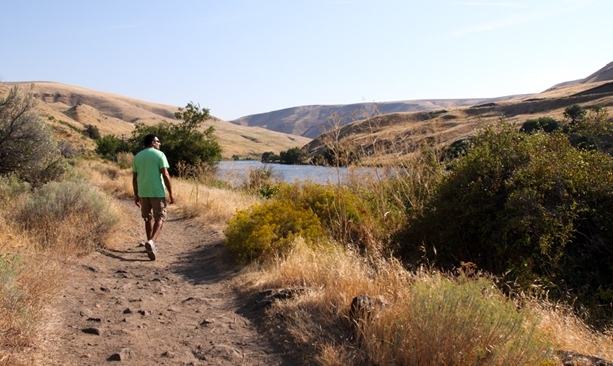 Hikers and mountain bikers will find a cache of sunshine on the Railbed Trail at Deschutes River State Recreation Area. 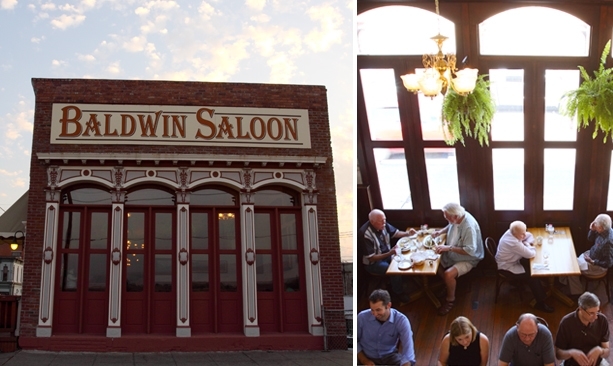 The Baldwin Saloon— serving locals since the 1880s. Dramatic views of the Columbia River from Celilo Inn. Ascending the curves of the Historic Columbia River Highway west of The Dalles, my anticipation grew. We passed a massive boulder field and columns of native basalt, and the car finally summited the plateau. The view from Rowena Crest — of the Cascade Range to the west and the grassy plateaus to the east — has never failed to impress. On our first visit, my husband and I both exclaimed, “I could live here!” And so we have — for nearly two decades. Winter is an excellent time to explore the drier side of the Columbia Gorge. From Rowena to the Deschutes River, visitors with the time and the inclination to exit the interstate will discover the beauty and bounty of the area. In The Dalles, a new generation of entrepreneurs is restoring historic properties and showcasing the area’s bounty at its restaurants, lodgings and watering holes. A new pedestrian underpass bypasses I-84 and links the downtown to a 10-mile paved trail along the Columbia River for walkers, cyclists and fishing enthusiasts. Recent waterfront development includes a new cruise boat dock and outdoor event site. My husband, Bill, and I began our two-day exploration with a one-mile walk on the Tom McCall Preserve Trail through a 271-acre nature sanctuary. Wildflowers may steal the show in early spring, but it is the plateaus, expanse of river, and clear skies that stand out in the colder months. Ready for refreshment, we headed to Clock Tower Ales in The Dalles. Locals Mark and Chelsea Powell have created a family-friendly gathering place in the county’s former courthouse and jail. The banquet room, dubbed “The Gallows,” once served as a viewing room for public hangings. Thanks to old photographs and local history buffs, the high ceilings, floor plan and facades have been restored to their 19th century glory. When faced with 27 microbrews on tap, why commit to just one? We tasted several favorites and newcomers for the price of a pint. Clock Tower’s classic pub menu offers pizza, burgers, salads, and sandwiches. The sweet potato fries with chipotle sauce make an especially nice accompaniment to the beer. After lunch, we walked to The Dalles Riverfront Trail, where cyclists and families with dogs were enjoying the paved path along the river. Next, it was a taste of the grape at the Sunshine Mill. The former flour mill and biscuit factory has been transformed into the home of Quenett Winery and Copa Di Vino. 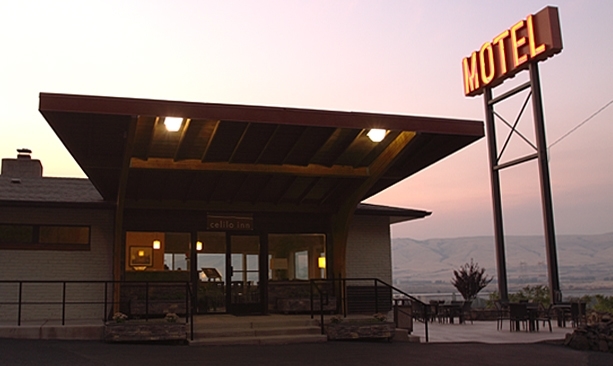 Owners James and Molli Martin, who hail from generations of farmers in the region, have created a cozy tasting room while maintaining much of the mill’s industrial feel. Watch for Mumford, the friendly basset hound, wandering among the tables fashioned from old shipping crates and metal guards and gears found onsite. As we sampled six Quenett wines, we viewed the bottling operation for Copa di Vino — Italian for “wine in a glass.” Thanks in part to James’ appearance on the ABC reality show Shark Tank, interest in the single-serving vino has boosted production to 24 hours a day. Once our glasses were empty, we slipped out the door to the terraced amphitheater and the bocce court. The Baldwin Saloon was our choice for dinner. As the oldest commercial building in town, it has served locals and visitors alike during its incarnations as a bar, brothel and coffin storage site. Owners Mark and Tracey Linebarger pay homage to the past with an antique 18-foot mahogany back bar, brass cash register and chandeliers. Turn-of-the-century oil paintings grace the original brick walls. Dinner entrees include prime rib, pasta and seafood dishes. We enjoyed sea scallops in a saffron cream sauce and the Dungeness Crab Melt. As the live old time piano music began, we ended our evening on a sweet note with a dessert of Triple Chocolate Decadence and housemade bread pudding with whipping cream and blueberries. 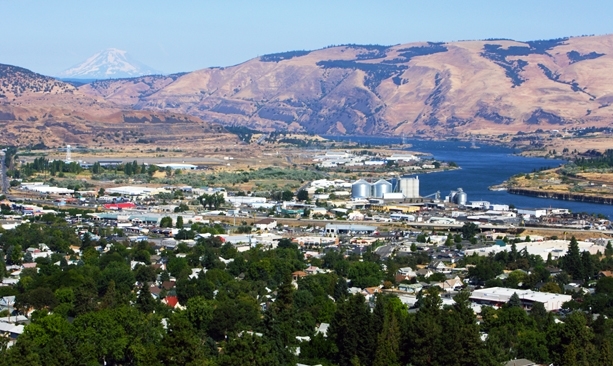 For those staying overnight in The Dalles, we recommend the Celilo Inn, where the rooms offer modern comforts with views of Mt. Hood and the Columbia River. A seat by the fire on the patio is one of the best places in town to enjoy the sunset. Enjoy the morning light on the hills across the Columbia River from bed with a latte from the hotel’s espresso bar. For breakfast, we visited Petite Provence — an appropriate location given that the town takes its name from the French “dalle” meaning flagstone or slab — a reference to the basalt rocks that line the river. This cheery establishment is a local favorite for fresh pastries, and it has a full breakfast and lunch menu as well. We selected a table with red booth seats, and we scored with the risotto cakes topped with poached eggs alongside Provencal potatoes and butternut squash. The portions were so large that we could finish only half of our plate-size croissant and stashed the rest for later. After breakfast, we drove east to Celilo Park, which honors the ancient native fishing grounds known as Wyam, or Celilo Falls. Though the falls were submerged in 1957 with the completion of The Dalles Dam, the location remains sacred for American Indian tribes. It is also a future site of the Confluence Arc, one of seven installations by artist Maya Lin along the Columbia River that interpret the area’s history and ecology. At the Deschutes River State Recreation Area, we chose to hike the Railbed Trail, the widest and driest of the park’s five options. Part of Oregon’s Rails to Trails system, the 17-mile path follows an old railroad bed and offers views of the sagebrush-flecked hills and the river below. The dry terrain and warmth generated by the canyon walls makes this an ideal winter destination for hikers and mountain bikers. Blue skies overhead, we set out at a leisurely pace on the lookout for bald eagles and bighorn sheep. In the distance, two anglers, hip deep in the current, cast their lines in hope of hooking a rainbow trout. It was just another day of discovery in the Gorge. Lori Russell is always on the lookout for her next great adventure-whether in the world or on the page. As a freelance journalist, she writes on topics ranging from travel, food, writing and health to people and their passions. 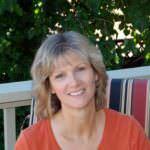 She is the editor at large for Oregon Home and her work has appeared in Travel Oregon, Ski Oregon, The Gorge Magazine and Oregon Unforgettable (Far Country Press).